"This is not a 'show' and we are not here to 'show' ourselves but to worship God"
OR "Please don't mind my voice, just listen to the wordings and sing along from your heart, you know God looks at the heart"
Are you familiar with these excuses when you go to worship concerts? Oga kuron'be jo make people wey sabi sing enter stage jare. Open Mic Sessions at PraiseVille is next Friday and it's gonna be a S.H.O.W! Yes you read me right... We are gonna show forth God's goodness through our talents. 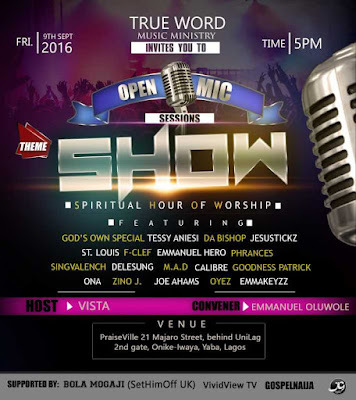 Venue: PraiseVille - 21, Majaro street, behind Unilag 2nd gate, Onike-Iwaya, Yaba, Lagos. By the way, S.H.O.W is an acronym for Spiritual Hour Of Worship and it's Open to All!